My husband has a couple of collections. One is Mountain Dew. He has all kinds of cans and bottles of Mountain Dew, from all over the world. He loves to drink Mountain Dew as well, so does his sons. His next collection is phones. He has a nice display of all his cell phones on his shelf at work. He loves cell phones and he has always had the last updated version. It's his area! He's a great guy! He strives to make his home as it is in God's kingdom, and to me, that makes him a collectible! He's worth keeping, and he brings me and his children great joy. 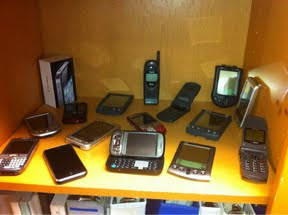 So, for Wordless Wednesday, tomorrow I have a picture of his cell phone collection. Jesus, thank you for the gift of my husband. Say That Again, to me, he is a collectible! My husband had a collection that looked a lot like that until he got tired of looking at it and realized that you can get paid for turning them in. We made over $100 on each phone, some of them more than $200!